Home / Exercise Habits: 5 Tips to Make Exercise Stick! Exercise Habits: 5 Tips to Make Exercise Stick! Are you one of those people who has a really hard time creating exercise habits that stick? You’re not alone. Long work hours here in the Silicon Valley combined with multiple after-school activities for kids as well as volunteer and social commitments really eat up the hours in our days. It’s common knowledge that regular exercise helps us maintain a healthy weight, manage stress and decrease our risk for some diseases. Even with the knowledge of how important regular exercise is to our well-being, we often don’t do it. Becoming a regular exerciser really comes down to making physical activity a habit. Over time, your habits become part of who you are. 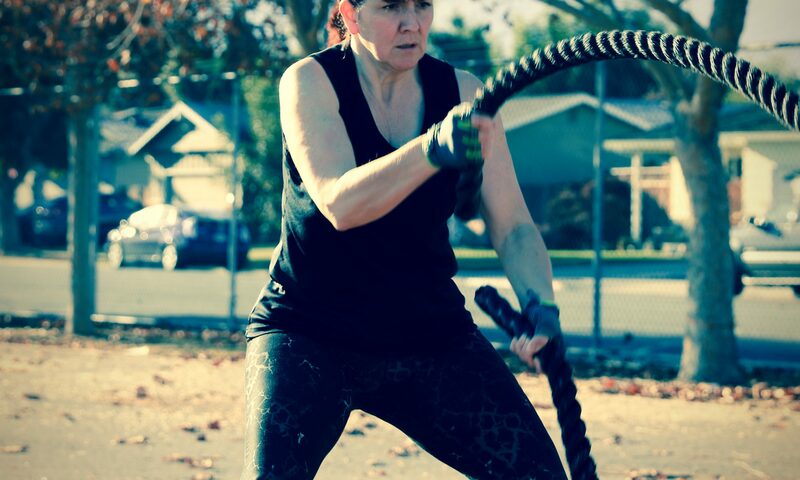 As a San Jose personal trainer, I work with my clients on activities and behaviors that will help instill a habit of regular exercise into their lifestyle. It’s not easy, but will repeated practice, you really can become a regular exerciser. You’ll actually feel the need to exercise because you feel better when you do and worse when you don’t! If you can’t stand doing it—you’re going to find every excuse in the book NOT to do it! If you hate swimming, just don’t even think about starting a swim program. If you really think you hate ALL forms of exercise, pick the least objectionable activity 😉 . Keep an open mind as to what the term “exercise” encompasses. You might need to move away from the concept of a regimented “workout” (say, a group exercise class) towards something we might define more as “physical activity” (perhaps a hike or a pick-up basketball game). When someone else is involved—you tend to show up. Get yourself an exercise buddy. And don’t choose a flakey friend! When you have an accountability partner, you’re MUCH more likely to stick to your program. Also, because your activity involves a social component, you’ll likely enjoy it more. This can be really hard, but I really want you to try it. Think of your exercise program as an appointment you keep with yourself. Just like you keep a dentist appointment—schedule your exercise and SHOW UP. See #2 for a way to make it more likely that you’ll show up (get that friend or co-worker committed to you!). Pedometers are great for counting steps and measuring your activity as are all the activity trackers out there (Jawbone, FitBit, etc). Sometimes just to get a few more steps in, you’ll take the stairs or park your car further away at the mall. I also ask my personal training clients to log how they feel while they exercise. When they look back over past months, they see how far they’ve come and how much their fitness has improved. I’ve found logging activity to be extremely motivational for many of my clients. Set yourself up for little challenges and rewards. For instance, if you do some sort of physical activity for X days this month, you’ll reward yourself with a trip to a sporting goods store for new gear, or perhaps you’ll gift yourself with a massage. Only reward yourself if you reach the goal you set for yourself. Good exercise habits take time to develop. Be patient, be consistent and keep repeating these 5 steps to become a regular exerciser who absolutely, positively makes time for exercise because its just part of WHO YOU ARE! Make a pact with a workout buddy to meet at the gym. You’ll be more likely to get up and go if you know your friend is waiting for you. The point here is to break down your exercise goals into small increments that you can achieve. Move from the theoretical to the practical. This is probably the most powerful secret. When you can visualize yourself in a situation that you really want, that’s where positive, long-term change can happen. I’ve got a client who made a collage of her favorite vacation place: Hawaii. Her goal was to be ready for swimsuits and short sleeves. So she found pictures of white sandy beaches, palm trees, and vacationers playing in the surf. She spent time every day looking at her collage, visualizing what it would feel like to confidently wear sleeveless sundresses on Maui. Studies have shown that those who envision what they want — and feel the good feelings that accompany it — are more likely to achieve their goals. What can you do to visualize your exercise goals? My client brought her collage with her at the gym, propping it up so she could look at it while on the treadmill. It kept her motivated and happy that she was actively working toward her exercise goals. Does this sound a bit woo-woo to you? Here’s a scholarly research article from Rutgers University about exercise motivation. When you link something you like (or love) to an activity, your motivation fundamentally changes. My boot campers know that I’m all about being realistic. At the end of a week I like to enjoy a good glass of wine (may be even two). This routine makes it easier for me to say no to an extra helping of pasta. What kind of rewards can you build into your weekly routine? It’s best if those rewards aren’t food related, something like soak in a bath, a massage or date night at the movies. Long periods of deprivation don’t serve you in the long run. Make a plan, visualize the reward of achieving your exercise goals, and reward yourself along the way. What other secret would you add to my list? Bay Area mud runs have exploded in popularity over the past few years. You may even be thinking of signing up for a mud run if you can run up to 12 miles, which is the distance of most mud run. But beware of the obstacles that are going to present themselves throughout the run. This is what you want to be training for. It is incredibly important that you incorporate running into your training regime. This is going to help build up your stamina and hopefully keep you in the race until the end. You will need to run at least three or four times a week and build up the amount you run on a day by day basis. You need to constantly improve yourself to ensure you can run over the distance of the race. Remember, some of your stamina is going to be taken up by the obstacles. This means that if you are running a three mile race, you should be able to run at least seven miles. Make sure that you run up hills, up stairs and up anything else which will make the run more challenging. Try not to run on flat surfaces constantly – that isn’t the best training for obstacle courses. Being agile in water is also important. 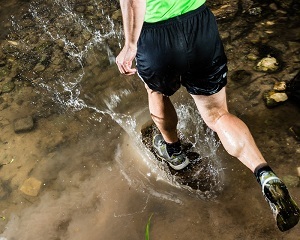 A few mud runs involve swimming, so be prepared for any challenge. In addition, swimming is a great way to build up your stamina, and every little bit is going to help towards a successful run. You also need to build up your upper body strength since the majority of courses include some sort of pulling obstacles (e.g. climbing ropes, climbing over walls, cargo nets, etc). Combine push ups with your running activities for more upper body strength. For a fun challenge, devise a course for yourself (e.g. run some, do push ups, run some more, do a different type of exercise, and so on). Work on your agility! Mud runs tend to involve a lot of obstacles to jump across or avoid. Don’t just jump up and down. Learn to jump from side to side. Work on that footwork and don’t stop working on it. Remember, in most cases a mud run isn’t a race. It is a challenge to get to the end. This will be one of the most physically demanding things that you have ever done in your life. If you can train to the point where you can make it to the end, you are already doing better than most people. If you’re looking for a mud run in San Jose, the Gladiator Rock ‘n Run will be held on June 15th-16th, 2013. The event is for all shapes and sizes. Perfect for anyone who wants to have a great time and challenge themselves. Save $5 off the registration by providing promo code: LIFESPORTFIT5 (must be in all caps). While a targeted workout will help with specific fitness goals like fat loss, there is a way to get additional movement into your day without leaving home. Thirty minutes of moderate exercise a day is recommended to maintain good health. But what if you just can’t make it to bootcamp or to the gym? There’s a way to use your housework as an exercise workout routine, especially if you put some elbow grease into it. Keep in mind that high intensity exercise is recommended for fat loss—but getting extra movement into your day will help you burn off a few extra calories! According to Weight Watchers you can burn up to 250 calories an hour by doing housework, depending upon how hard you work and your weight. Burning calories doing chores isn’t limited to inside, you’re workout routine could also include gardening and other yard work. Be inefficient. For example, when you’re doing laundry take one load at a time rather than gathering everything at once. By making multiple trips you’re burning more calories. As you are putting things away think how you might run up the stairs more times. You get the idea ;-). Rock out. Nothing will get you moving faster than energizing music. It’ll make the experience more fun and increase your pace while doing your housework workout. Waiting for the laundry to finish drying, dance, swing your arms, do lunges or jumping jacks in place. Mix it up. By varying your tasks means you’ll be using different muscle groups. Making a bed uses different muscles than vacuuming or washing windows. Organize it. Have a pantry or closet that needs some organizing. That’s a perfect time to use a step stool and lift items that will strengthen your arm and back muscles. Of course housework shouldn’t be your only form of exercise–it’s just a way to increase your movement during the week. But stepping up the intensity when you do housework might potentially shave off a few pounds if your nutrition is in check. One way to track how active you are — when you’re exercising or not — is a FitBit. This tiny electronic companion measures your activity, plus you can tap into the FitBit community to get ideas and join in on some fitness challenges. So, the moral of the story is: You can’t expect to lose body fat by doing housework alone. However, housework such as vacuuming and scrubbing floors by hand will definitely put a dent in your overall calorie burn for the day. If you’re looking for ways to increase your overall “calories out” during a given day, pick up a mop or pull out the vacuum cleaner, throw on some high energy music and get moving!! Happy Holidays! It’s that time of year again to begin creating a holiday gift shopping list. If you have a fitness enthusiast on your list, giving them a fitness/exercise related gift is a great way to give them a very personalized gift you know they’ll use and enjoy. If you have a person on your gift list who is currently out of shape and wishes to improve their health, what better way to support and encourage them than to give them an exercise or health-related gift! Just about everyone we know (including ourselves) needs to change up their routine, get some new workout gear, or pamper their hard-working body. We all need to “change it up” from time to time. Giving a friend a pass to try new workouts is a great way to encourage them to try new things or simply get up off the couch. Buy a pass for yourself and make it an opportunity to spend quality time with someone you care about. A jump rope is one of my favorite go-to pieces of equipment for interval training and circuit training. It’s also a great travel workout accessory. It’s easy to pack and can be used almost anywhere. A jump rope makes a great stocking stuffer! Medicine balls are a great addition to someone’s home workout arsenal. You can use them for core training, strength training and cardio training! For people who work out at home, an exercise DVD is a great gift! You can find DVDs on any type of exercise including strength training, yoga, pilates, kick boxing, and even complete medicine ball workouts. If you don’t know what your fitness enthusiast friend might like, a gift card to a local sporting goods or activewear store is an idea to consider. I haven’t met a fitness enthusiast who doesn’t love a good professional massage. ‘Nuff said. This is giving a true gift of fitness! One month of professionally designed, calorie-blasting workouts and personalized attention for the special person on your list! If the person on your list isn’t a “group” person, or needs one-on-one help, a few sessions with a professional fitness coach may be just what they need to get them started safely. This is one of my all-time favorite home exercise devices! You can use it at home, at the park, and even in a hotel room. Click on the image below to find out more about this amazing exercise equipment. Okay. So that’s my list of a dozen ideas for great exercise, health and fitness related gifts. Let’s get some more exercise and health related gift ideas going! What other items should we add to my list? Leave a comment here your exercise or health related gift ideas! Wishing you a happy holiday season and a healthy 2012! Many thanks to Sydney Simmons of MesotheliomaSymptoms.com for this guest post on the benefits of exercise during cancer treatment. For a healthy individual, exercise can provide both physical and emotional benefits. However, for those with cancer, taking part in high intensity fitness programs can often be overwhelming. Even if heavy exercise is contraindicated for a very ill patient, with their doctor’s approval they may be able to consider a lower intensity exercise program for the psychological benefits a regular fitness regimen can provide. Lower intensity exercise might include walking, light bike rides, and light strength training. The exercise level that is appropriate for a particular person battling cancer often coincides with the stage of cancer a patient is in. In stages one and two, patients are likely to have greater strength and stamina than if they are in a later stage of cancer. For example, mesothelioma cancer patients have a staging system which goes from one to four. Patients who are in stages one and two can often be found partaking in regular routines of exercise and fitness because it helps them feel better and withstand the rigors of treatment better. Besides allowing them to maintain some level of their fitness during treatment, many cancer patients find that regular, gentle exercise can help cut down on the side effects of chemotherapy and radiation. Chemotherapy and radiation can often limit the body’s flexibility and bring on nausea and other unpleasant symptoms. Yoga has been found to not only help cancer patients maintain better flexibility, but also to improve their mental well-being. Time spent exercising can positively affect the mental state by allowing time for reflection, and time away from the hospital, testing, and meeting with doctors. Certainly physical fitness can bring great value to everyone. For cancer patients, it can play a very special roll in improving stamina during treatment as well as improving mental and emotional outlook. The Mesothelioma Support Network has pulled together as a single resource everything related to asbestos in order to promote education and awareness for victims, their families, and the general public. Our goal is to provide accurate, relevant information that can be used for general informational purposes, and to advocate for a greater awareness of the dangers of asbestos and the realities of mesothelioma.